Mike Tyson vs. Muhammad Ali, Tom Brady vs. Joe Montana and Hulk Hogan vs. John Cena are some of the biggest “Who is the GOAT?” debates of all time. These arguments can be heard in bars all across America. But one day, in the not so distant future, you can add one more to the list: Justin Herbert vs. Marcus Mariota. Who is King of the Pacific Northwest? When you play the Game of Throws, you live or you die. Ok… nobody is going to die, but you can live forever as a sports legend. When it comes to football in Eugene, people are passionate. You can cement your name in the record books, come back to Autzen and be greeted by a standing ovation. But you could also never be invited back… LOOKING AT YOU, JEFF LOCKIE! Could Herbert dethrone Mariota as the Oregon GOAT? Mariota is currently the undisputed GOAT. Being the first and only Heisman winner for the program is a big deal. 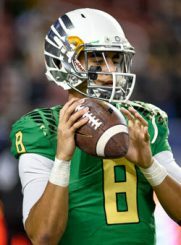 Mariota played three years at Oregon, and he improved every year! One day, however, someone might able to take the crown from him. Let’s look at the most viable contender, the man who shocked the world by returning for his senior year when he would have been a top-10 pick in the NFL draft. If we look at just numbers, Herbert and Mariota should finish their careers with a similar number of games played. Herbert did not start his freshman year until mid-season, and in his sophomore year he suffered an injury. Mariota played 41 games, and if Herbert plays every game this year, he should finish with 41-43. Mariota ended his collegiate career with 10,796 yards, 105 TDs and 14 INTs. Herbert currently sits at 7,070 yards, 63 TDs and 17 INTs. Herbert is one Heisman-like season away from coming close to, if not beating, Mariota’s career numbers. In 2014, Mariota had 42 TDs (that’s how many Herbert needs to tie) and 4,454 passing yards (Herbert is 3,726 from a tie). The biggest difference we see in stats are in the rushing numbers. To tie Marcus, Justin needs 1,727 yards and 20 TDs. To put that in perspective, Kenjon Barner had 1,767 yards and 21 TDs in 2012. I think it’s safe to say the rushing numbers won’t compare for our two QBs. Could Justin Herbert become the GOAT? Hop on the trolley, and let’s go to the Neighborhood of College Football Make Believe. Herbert goes 13-1 this upcoming season, the loss most likely to Auburn in Dallas, though other candidates include @Washington, @USC or @Arizona State (we never play well in the desert). Herbert throws for 4,500 yards, 47 TDS and 5 INTs. He wins a Heisman and a National Championship. The first National Championship in Oregon history. The Heisman will be difficult. Look at the odds for the heavy favorites: Tua Tagovailoa QB Alabama (+350), Trevor Lawrence QB Clemson (+500) and Jake Fromm QB Georgia (+550). However, a dark horse always emerges, and true freshmen can play like fifth-year seniors in today’s game. This group of Heisman contenders is much deeper than what Mariota competed against, but Mariota put up crazy numbers that would have won in almost any season. Winning a National Championship will be difficult, too. Clemson doesn’t look like they will slow down, Nick Saban and Alabama are going to be on a revenge tour, and Georgia looks like they will be better than last season. If Herbert wins a more impressive Heisman and a National Championship, potentially beating three SEC teams along the way (Auburn and two in the playoffs), his track record would compare well to Mariota’s. At that point, would he sit on the thrown and be Oregon’s GOAT? It’s a thought that two years ago was unimaginable. 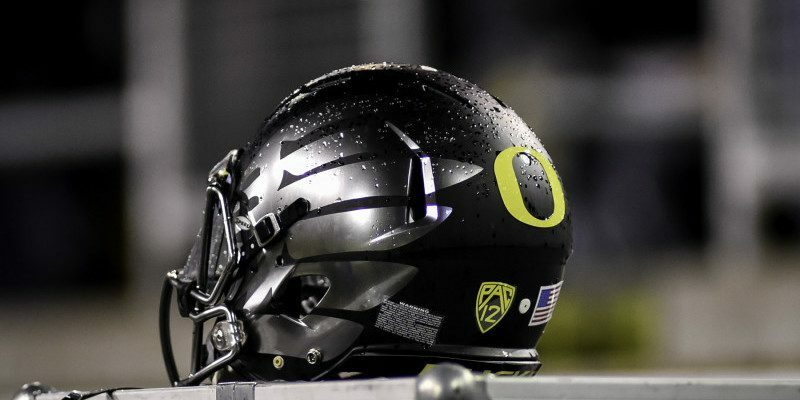 Not just for Herbert, but for anyone who plays or will play at Oregon. Mariota is the Michael Jordan of Oregon. But Herbert just may be the LeBron James.